‘35° 09’ 53” S – 150° 34’ 35” E’ and ‘33° 36’ 52” S – 150° 16’ 05” E’ are hybrid objects: they function as easels and benches, sculptures and large photographs which in scale recall both billboards and projection screens. Geoff Kleem has had a significant engagement with the legacy of minimal art and these two works were created after a residence at the Chinati Foundation, Marfa, Texas, built by American artist Donald Judd. With their pared back structures and repeated units, the works can be associated with minimal art, although it is doubtful if any self-respecting minimalist would place a large close-up image of rubbish on one of his or her sculptures. The utilitarian nature of Kleem’s objects is also at odds with minimalist sculpture; these are not just forms in space: they support things and can be sat upon, recalling another great late modernist development, self-assembly furniture. Unlike the American minimalists, Kleem injects into his austere constructions and photo/object juxtapositions both a sense of humour and a context that connects to the world around him. While minimalism celebrated industrial materials, Kleem uses his structures to present photographs of industrial waste. 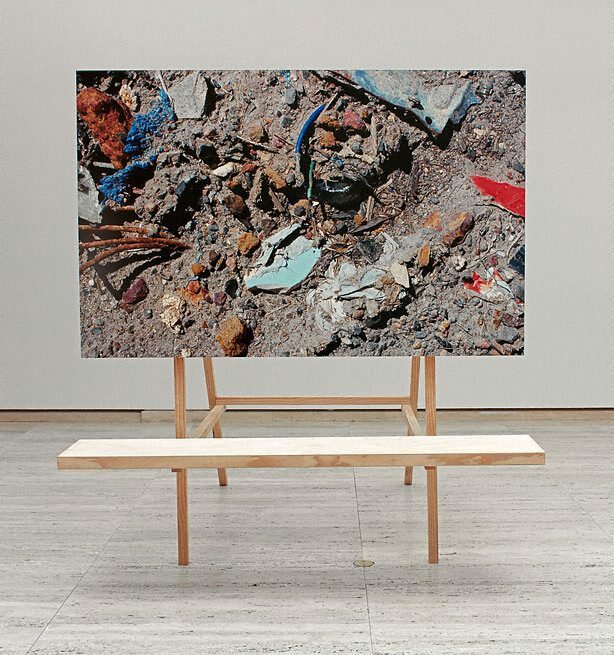 The two large photographs, which appear abstract from a distance, turn out to be exactly what the series title says: international trash. The code of the first part of the title (‘33° 36’ 52” S – 150° 16’ 05” E’ for example) is the exact location of the rubbish that Kleem has photographed, defined by GPS (Global Positioning System) readings taken from a handheld global satellite tracker. In the photographs the rubbish is magnified many times, enlarged from its micro scale and located by the macro scale of this mapping system. The images themselves are layered and suggest the depositing of some strange new geological strata, part natural but largely artificial and created from layers of detritus that we deem no longer useful. Kleem has also created a series of wheeled sculptures which resemble storage units or trolleys, seemingly made to assist the function of the museum to conserve and display art and yet as art objects themselves they cannot fulfil a purpose beyond being exhibited in the gallery or placed in storage. In choosing to exhibit images of rubbish in an art gallery, Kleem seems to participate in the aesthetisising of waste that many artists have undertaken, finding art in abject discards. He also presents the art object as a conundrum of implied usefulness and lack of purpose: now that we no longer expect art to provide a pure unmediated experience of itself, what we are left with seems suspended between our desire for affect and possible irrelevance. While they may seem like binary opposites, the accumulation of things and cultural strata that the museum stores and records are in some way directly connected to the discarded things that are no longer valued and become the strata of landfill. Blair French, Eyeline (No. 50) , 'Geoff Kleem: architectures of display', pg. 34-36, Brisbane, 2002-2003, 34-36, 35 (colour illus.). Wayne Tunnicliffe, Contemporary: Art Gallery of New South Wales Contemporary Collection , 'Reality bytes', pg.382-423, Sydney, 2006, 404, 405 (colour illus. ).